When I was a kid, I developed a serious apprehension about dogs. This feeling was exacerbated when I rode my bike, largely because one of the rural roads I often traveled was also home to Snoopy, the big mean biting dog. Snoopy was always in her yard, lying in wait for innocent targets like my sister and me. 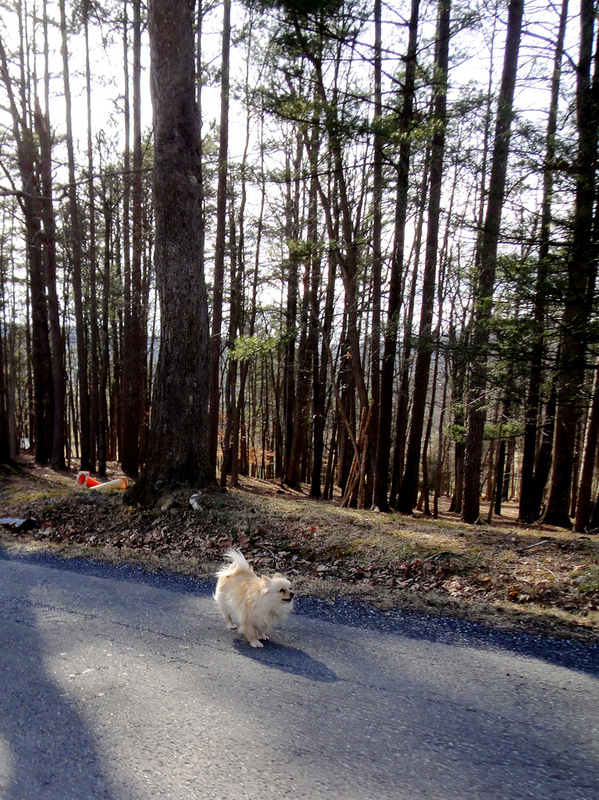 As we approached, Snoopy would charge across her lawn and out into the road. Her mission was always simple and scary: bite children’s ankles as much as possible. Snoopy knew I was bluffing, and stayed focused on the prize that was my ankle, or any other part of me that she could nip on. 2. Ready and raring to eat me if just given the chance. I grew up and moved away from rural life. I eventually settled in Washington, D.C., and Snoopy the big mean biting dog, became a fuzzy memory. Until I took up randonneuring, that is. Through cycling with the D.C. Randonneurs, I was re-introduced to rural life, Mid-Atlantic edition. On my first rides through the countryside, memories of Snoopy loomed large whenever I spotted a dog or heard one yowling in the distance. Over time, though, I realized that not all country dogs are like Snoopy, the big mean biting dog. In fact, most are not. My completely unscientific study of them over the years has shown that a variety of dogs exist in the country, and they often make for quite pleasant encounters. Not always, but enough that I don’t equate all dogs to Snoopy. Here’s a sampling of the dogs I’ve come across on rides. I’m sure I missed at least one or two so please let me know in the comments. I do not want any country dog feeling left out! These dogs are often on the small side and know that, at a minimum, they must defend the fort with the fiercest barks they can muster. As soon as they discover a cyclist passing by, they launch themselves out of the yard and position themselves either at the end of their property or on the road and begin howling away. While the barks themselves might intimidate, the fact that they are coming out of a fluffy dog that you know you could clearly deal with if needed makes them easily managed encounters. Bluffers do not extend much, if at all, beyond their property lines and clearly do not want to make physical contact. Rather, they want to establish who is they mayor of their turf and it is not you. The majority of dogs I’ve met on rides are runners. They see cyclists passing by their home and it makes them want to stretch their legs, too. “Hi cyclists! Where are you going? Let us keep you company for a bit,” their actions seem to say. 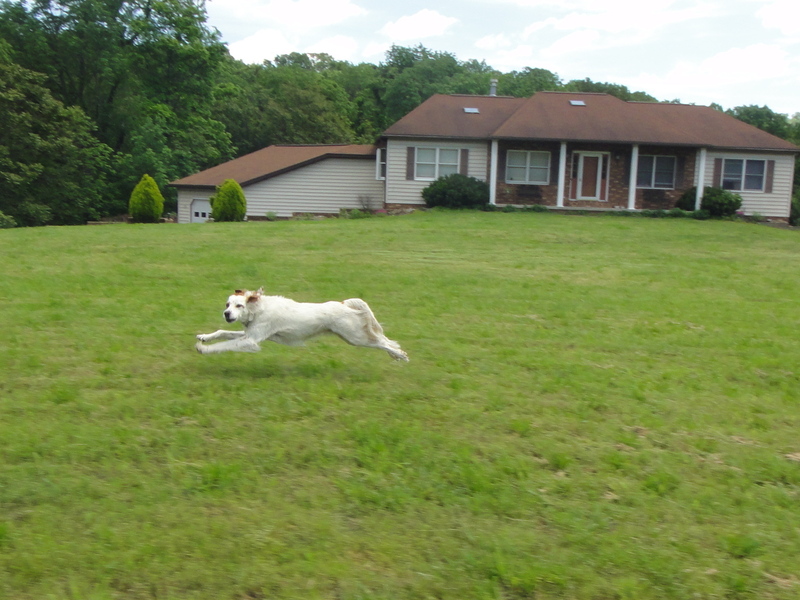 Dog action shot. The runner. 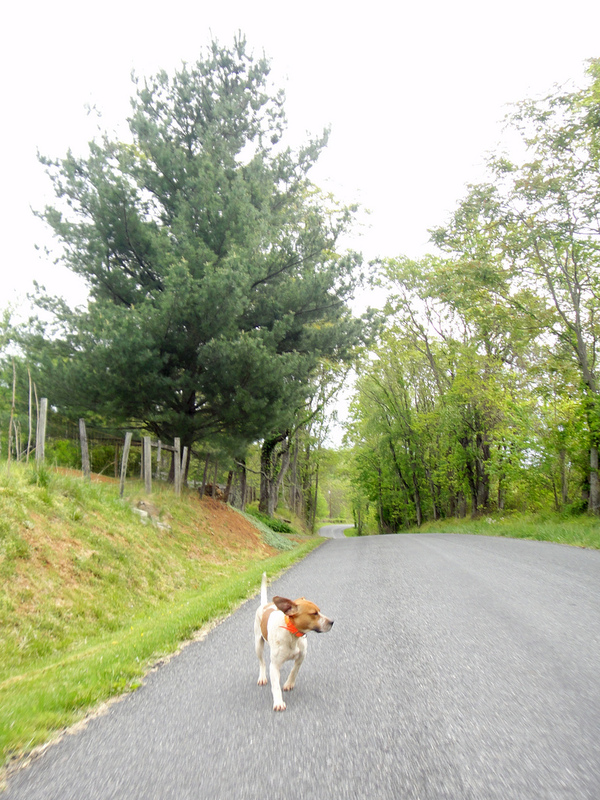 Some runners are restrained from the road by the invisible fence collar gadget, which only allows them to run alongside you at a distance from the comfort of their own yard. Others have no restraints, happily bark out a welcome, and then take great pleasure in running either alongside you on the road (for the intrepid) or along the shoulder (for the more timid dog that lives in an area where there actually is a shoulder). These dogs are lots of fun to see on rides. They mean no harm, don’t veer perilously toward you or your bike, and just want to share in a few paces of your adventure. 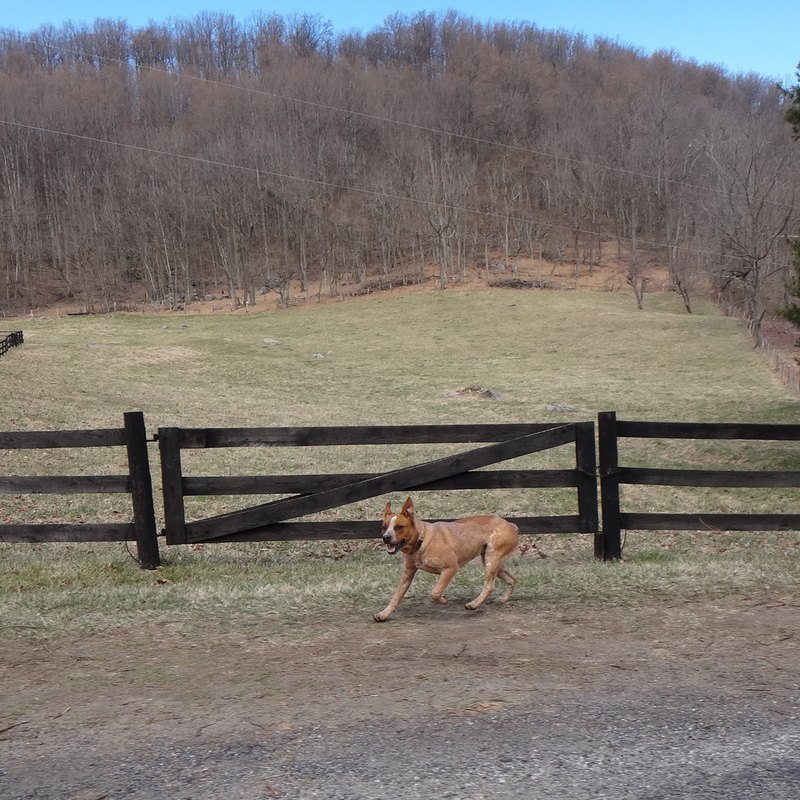 Lots of dogs I see in the country are leashed or restrained by a fence (either electric or wooden) around their property. They have space to run, but unless they break through the fence, they are yard-bound. Occasionally, I also pass dogs that have been chained up, leashed, or kenneled. While I am glad to know that these dogs cannot accost me, seeing them restrained this way also saddens me. What kind of life is that? I wonder. It does not seem like a good life for a dog. Maybe it’s because I grew up in the country where space was a given and most dogs were not leashed. That said, the barks of some of these dogs and the forcefulness with which they pull against whatever device confines them to their yard makes me think it might be better for them to be leashed than roaming freely. These are the wild card dogs. You do not know what they would do if they were free. If you see a dog that you discern is a puppy, watch out! The kind of puppies I’m talking about are those that are the equivalent of teenage puppies. They’ve hit their physical growth spurt, but have not yet learned the ways of the world or, more importantly, the road. Naïve puppies are overwhelmed with excitement when they see humans on two wheels riding by. Propelled by a primal puppy energy passed down from canine generations past they only know their purpose is get out there and do… something when they see you. What that something is, they’re usually not sure. They might run alongside you, and then swerve toward your bike in a spontaneous urge to smell it. Or bite it. Or lick it. If you happen to meet up with a naïve puppy on an uphill, they could run ahead of you, and then make a u-turn right in front of you (sort of like the tourists do around here). If a car comes from the other direction, it completely throws them, as they are still learning the ways of traffic flow and the danger of cars. Do they try to lick the car (bad idea, BAD IDEA! ), get out of the car’s way, get in your way, or what. The naive puppy does not know. Despite their sketchy moves, puppies are usually a lot of fun to see. They’re enthusiastic and brimming with energy. However, their unpredictability poses a concern for us cyclists. Nobody wants to collide with a dog. While these dogs might have been runners or bluffers in a previous life, they are too mature for that stuff now. Now when a cyclist goes by, they don’t lift an eyebrow. Or maybe they only lift an eyebrow. These are the dogs you find lying in the driveway or the front yard, soaking up the morning sun and possibly napping. Even if you shout a good morning greeting their way, you’re unlikely to get much of a reaction from them. Silent types are the dogs I fear most. These dogs mean business, and when I mean business, they want to bite you. When they spy a cyclist, they move as stealthily as possible in their direction. They would not dare bark or make their presence known, as they know that the element of surprise is critical to their success in getting as close to you as possible. Silent types are often mid-sized and I would categorize them as mean-spirited, probably because I take umbrage with them viewing me as their prey. In my years of riding, I’ve only met a few silent types. Fortunately, they never attacked me nor did they make contact with my bike. However, they sure did scare the BEEP out of me. 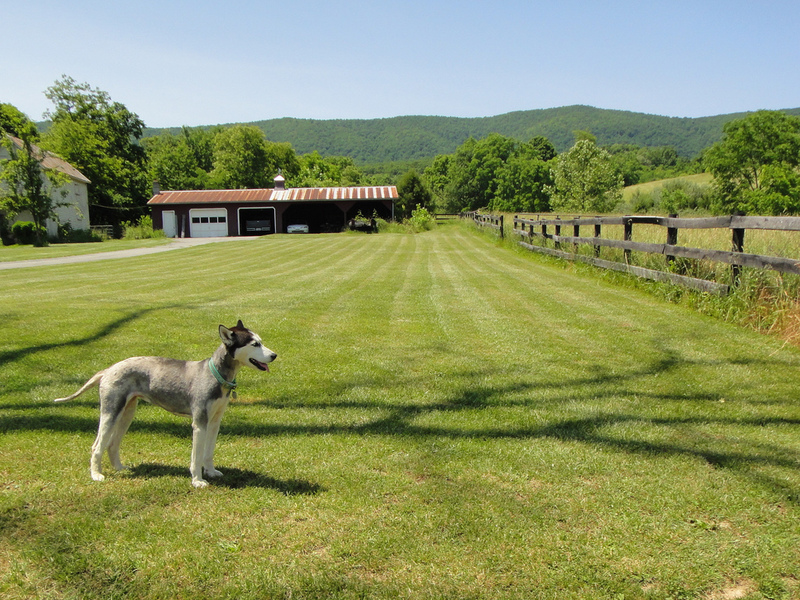 When I initially began riding in the country after years of living in urban areas, I hoped that everybody’s dog would be fenced or restrained. I’ve had a change of heart since then, at least when it comes to most dogs. As long as they do not dive in front of the bike or hurl themselves between my wheels, avoid leaping toward any of my body parts with their jaws open, and act somewhat predictably (like a good cyclist would) I’m really alright with them. They’ve spiced up many a ride and some have been fun to ride alongside, even if only for a few tenths of a mile. Surely you have met a few dogs of your own on a ramble in the country. Which ones did I miss? Have you not encountered the team players? These are two or more dogs who work together, one or more silent and sneaky, one loud and distracting, so the others can surprise you and cut you off. These seem to be students of geometry, and when I see them, I sprint like he**, as these are almost always bad news. No, not yet! Only the dual runners, not team players. Hmmm, I will have to be on the lookout! Great classifications, but I’ll add that it can be harder to determine them when riding a low recumbent and your head level is their head level. EEeep! Years ago I had a couple ‘runners’ come out to meet me. Though I didn’t know that was their plan at the time. I ended up having a dog on each side of me, about even with my rear wheel, and about 3′ away. 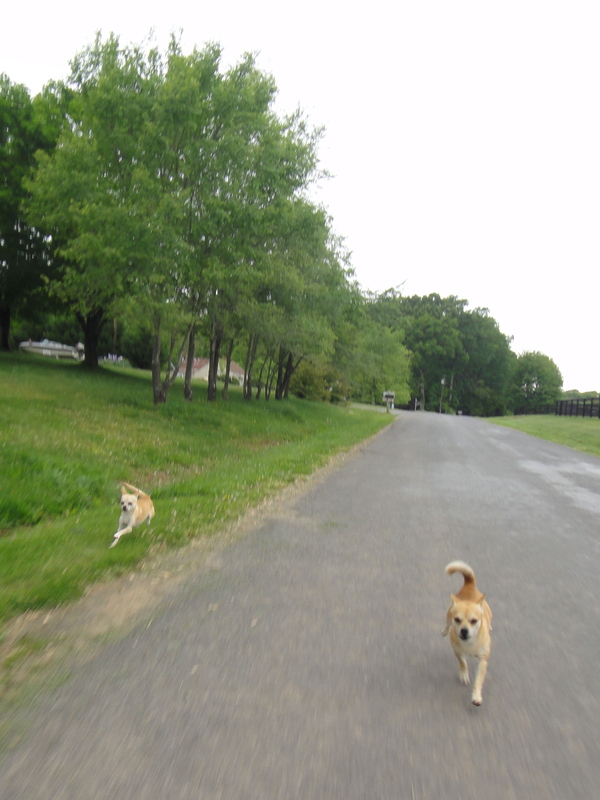 They ran with me for well over 1/4 mile. I had not even considered the recumbent cyclist. I like being taller than the dogs when I’m on the bike. 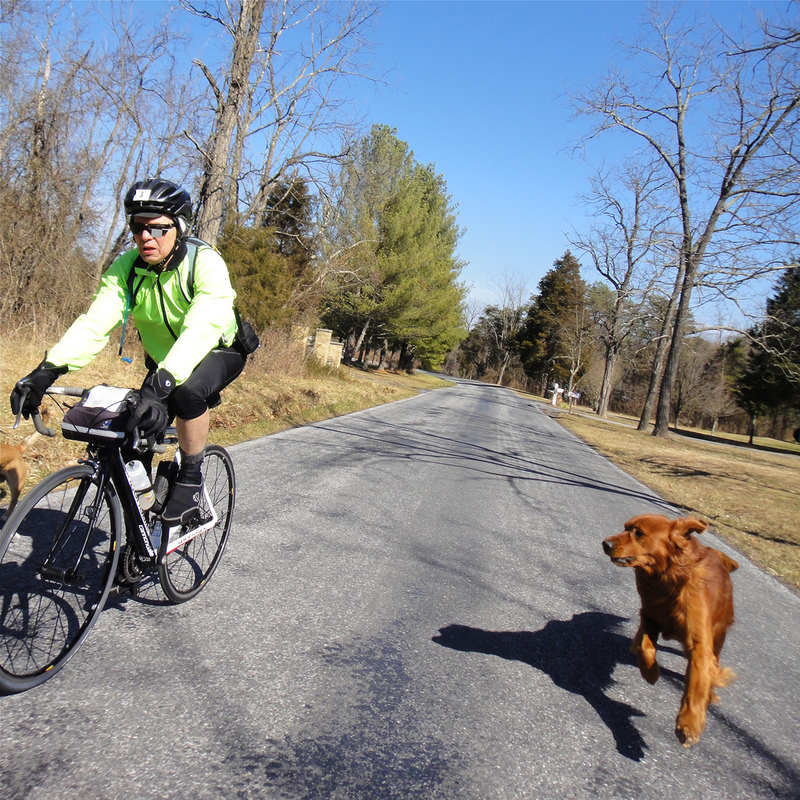 I agree that dogs bring a whole new dimension to riding when you are on a recumbent. When you see teeth inches from your face you know you need to get out of Dodge FAST! The silent type almost always give themselves away when their claws hit the pavement. As soon as you hear their paws clicking closer and closer you know you are in for it. i love that some just want to share a few paces of the adventure, but, YIKES, those crazy-silent-scary ones!!! there are a few on my road…. 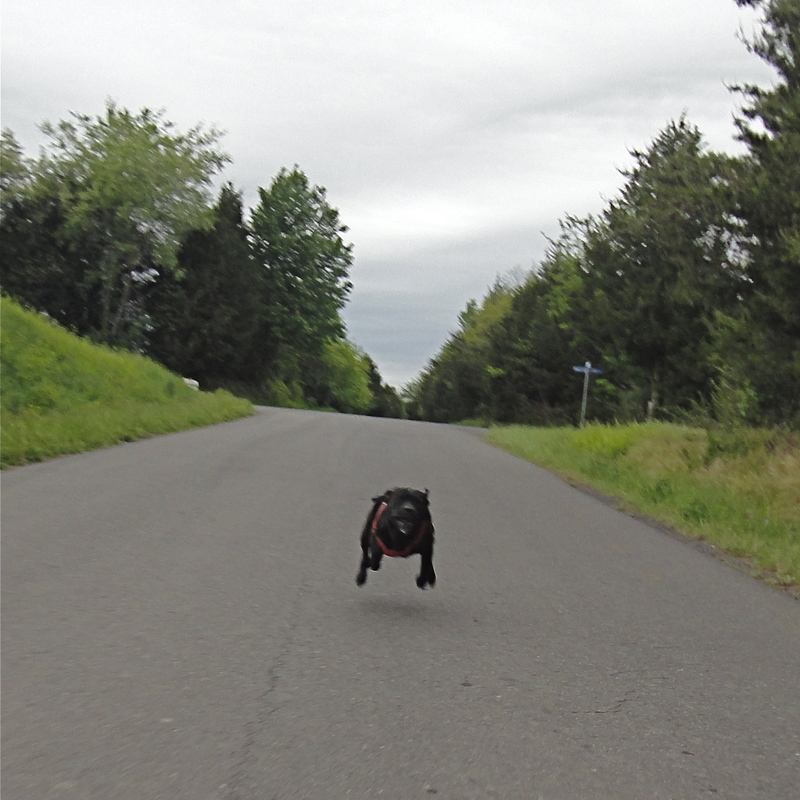 The fastest I ever pedaled…being chased my a farm dog who took exception to my riding on his country road. He chased me for a half mile and I had redline to pull away from him. The rest were mostly bluffers or dogs who just want to play. 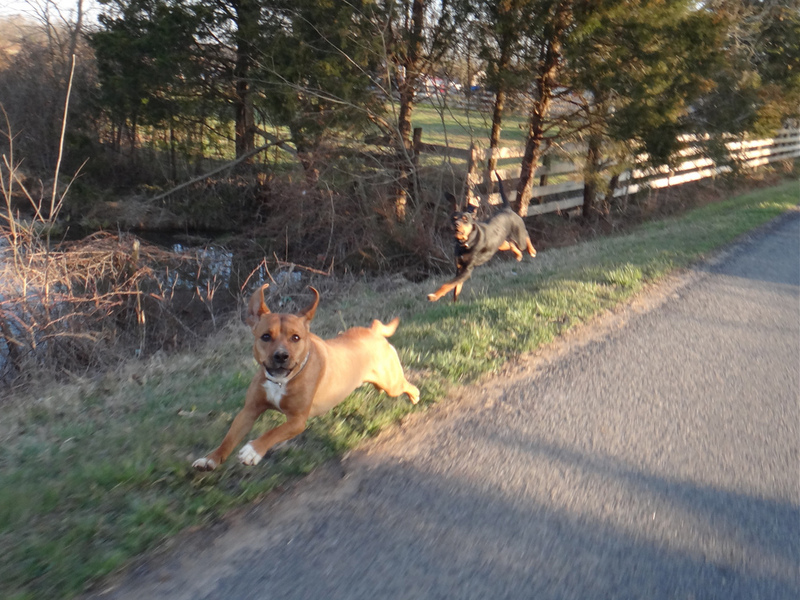 As a runner trying to get in a few miles on a country road, almost all dogs except the Bluffer and the Retiree are a danger. Since my pace is much slower than theirs, and I have no option of lifting up my legs in the event of an attack, country dogs are much scarier. I haven’t been bitten, but perhaps only because I stop, face them and back away slowly. Stressful! Running in the country is so different because you just don’t have the same speed as a bike. We were fortunate with Snoopy; she didn’t care as much about runners. Also, the other country dogs in our area were pretty friendly, although my dad did have one run about two miles and follow him home once.